Number one national seed Miami is two wins away from an expected berth in Omaha, but they have a hungry bunch of Wildcats to go through in an Arizona team that was ranked #1 in the preseason. The top-seeded Hurricanes survived a couple of tough tests against Bethune-Cookman and Missouri to win the Coral Gables Regional, while Arizona made the long trip to Ann Arbor, Michigan, but there wasn't any jet lag as Andy Lopez's Wildcats swept through the field, beating Eastern Michigan, host Michigan, and Kentucky to win the regional as the #1 seed. Who will win this battle of top seeds and earn a trip to Omaha? Miami, the consensus #1 team in the country and the top seed in the NCAA tournament, comes into the supers at 50-8 overall, while visiting Arizona is 41-17. The Hurricanes swept the ACC regular-season and tournament titles, while the Wildcats finished tied for 4th in the Pac-10 with a 12-12 mark. Miami advanced to the supers with an 11-2 win over #3 Ole Miss in the championship game of the Coral Gables Regional, while Arizona advanced with a 5-3 win over #3 seed Kentucky in the title game of the Ann Arbor Regional. Mark Light Field is no stranger to hosting postseason action. This is the fifth time in the 64-team NCAA tournament format that the stadium has hosted a super regional, and each of the previous four times (1999, 2001, 2003, 2004), the Hurricanes have advanced to the College World Series in a two-game sweep. This season, Miami is 30-5 at home. How much of a chance Arizona has hinges on starting pitching that is undoubtedly among some of the best in the country, but hasn't always performed like it this season. 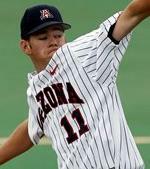 If ace Preston Guilmet (6-4, 4.29 ERA) can pitch like the All-American that he should, the Wildcats could set themselves up with a first-game victory and leave it to David Coulon and Eric Berger, two more quality arms, to finish the Hurricanes off. However, Miami's starters aren't shabby in the least, in unbeaten Chris Hernandez (11-0, 2.55 ERA, 105 Ks), Eric Erickson (8-1, 4.13), and Enrique Garcia (6-2, 4.80). Based on potential and talent, I'd go with Arizona, but based on performance, Miami's rotation might have the edge. So, I'll call it a wash.
Arizona has some terrific hitters in the likes of C.J. Ziegler and others, but Miami's got the edge here, without a doubt. Besides the big bat of Yonder Alonso (.370, 21 homers, 66 RBI), the Hurricanes have six other players with at least seven homers, six (seven counting Alonso) with at least 40 RBI, and four (including Alonso) with averages of at least .366. Miami has a couple of studs in the pen in Kyle Bellamy (6-0, 2.11 ERA in 38 appearances) and Carlos Gutierrez (5-2, 2.70 ERA, 11 saves), but the Wildcats have their own as well, with the trio of Daniel Schlereth (2-0, 1.81 ERA in 34 appearances), Ryan Perry (6-3, 3.07 ERA), and Jason Stoffel (3-2, 3.25 ERA, 13 saves). Miami is two wins away from their 11th College World Series appearance under Jim Morris, and until last season, had the distinction of making every super regional since the expanded format was introduced in 1999. While Morris' resume is pretty stellar, Andy Lopez has built an impressive resume throughout his career, leading three different schools to Omaha and winning a national championship 16 years ago. There's something about the potseason that brings out the best in Miami, it seems. It's hard to pick against them at this point,especially when they're playing at home. The juniors and seniors on the club have the experience of playing in Omaha, and the guys who were on last year's team no doubt have the bitter taste of an early regional exit. Arizona doesn't have that same experience, but their coach does, as Lopez led Pepperdine to a national title in 1992, led Florida to Omaha twice, and led the Wildcats there in 2004. Miami had a couple of tough games against Bethune-Cookman and Missouri in the regionals, so the Hurricanes certainly aren't invincible. There's no doubt that they should emerge from this coming weekend as one of the last eight teams left, but Arizona has an excellent chance of leaving south Florida with a ticket to Omaha. But, it all depends on a big, big if. If Guilmet pitches well - and maybe, just maybe, the big stage will bring out the best in him, then that will be big, not only on the scoreboard, but in the confidence department for the Wildcats. It won't be easy for them to come back if they drop the first game, especially if it comes with Guilmet on the mound. What will the series turn out to be? It could be a pitcher's duel, with the quality arms that each team has, but at the same time, it could turn into a slugfest, because both teams have the ability to put up a lot of runs. For Arizona's chances, however, it all hinges on pitching well, and not getting intimidated by the atmosphere.